Both of these vines are informally called “Cup of gold”, Copa de Oro, or Golden Trumpet vine. Both have similar growing habits and come from the same area, mainly Mexico and South and Central America. Allamanda shows up everywhere in the landscaping of the Bay of Banderas. You will see it climbing trees, on fences, and forming hedges. It is also called Yellow Bell or Butter Cup flower. It blooms most of the year, but it is at its best in warm bright conditions.Most of the blooms will be on the sunny side of the fence, so plan accordingly. 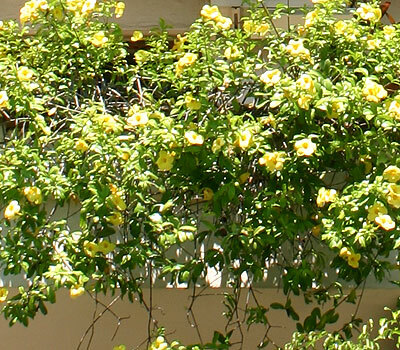 In nature, Allamanda grows along riverbanks and other open, sunny areas with adequate rainfall. 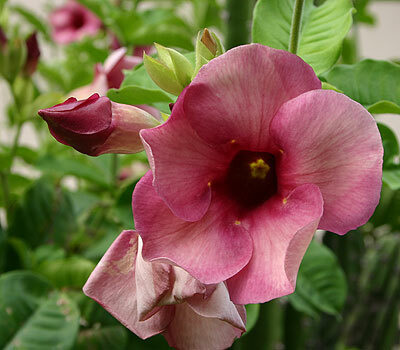 Allamanda is a woody evergreen shrub with vigorous growth reaching out 8 to 10 feet or more. The leaves are very leathery and pointed. The yellow trumpetshaped flowers are 3 or 4 inches in diameter. If well cared for and fertilized, the blossoms will be larger. Besides yellow, you may also see white, purple, pink and orange. They have a very tiny bit of scent that is delicate and fruity. The things Allamanda does not like are shade, salty or alkaline soils. And they are very sensitive to cold weather, which is clearly not a problem here. For the most part they are undemanding, and with proper care you can expect 10 to 12 feet of growth per year. In some areas, Allamanda are an invasive species, especially in Australia. Propagation is by cutting, and they root very fast. Sometimes you may even see them growing from a pile of cuttings or in a dump. They are survivors raring to grow. They produce a seed capsule that is oval and prickly, but the pods from cultivated forms rarely produce seeds. 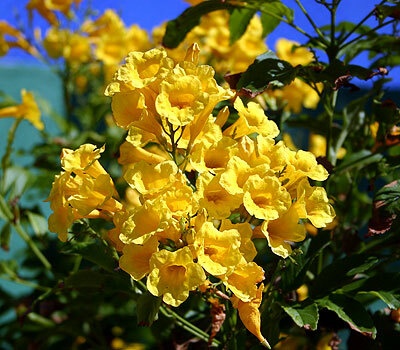 The sap from Allamanda can be irritating to some people, causing rashes, itching and blisters. This plant is very gardener friendly. Allamanda can also be grown in pots, but must be kept trimmed to retain its shape and stimulate new growth. Give it lots of water while it is blooming and growing, but cut it back when the leaves shed and the blossoms fade. Feed it when new growth appears. This is a very large cup of gold, also called Chalice Vine. It is a very thick, heavy vine with large shiny leaves. The flowers are large and bell shaped, and the stems are woody and rope like. Solandra is a very vigorous grower, and can send out vines up to 200 feet long which cling to everything in its way with aerial rootlets. The leaves are about 6 inches long and very leathery. The blossoms are truly spectacular and can reach a depth of 6-10 inches with an opening of 4 to 7 inches across. The flowers start out yellow and turn deeper golden as they age. They are fragrant, especially at night. The scent resembles that of coconut. This cup of gold blooms intermittently through the year, but blooms best in the dryer, cooler season. It is very fast growing and thrives in most any well drained soil. It loves severe pruning, as it blooms on the new growth it stimulates. Solandra is so heavy it requires a strong support. Give it full sun to partial shade. It requires regular watering, but withholding water will stimulate blooming. Let the vine grow for a while, producing vigorous new shoots, then withhold water until the leaves begin to wilt. It reproduces easily by cuttings from mature stems. Both of these vines are extremely vigorous growers; it is best to plan ahead before they are planted. Solandra is so strong it will lift tiles from a roof. If it has a strong support and goes untrimmed, all the blossoms will be at the top pointing upwards. If you can trim it so it stays shorter, then you can look into those beautiful flowers. Allamanda is easer to control and produces more flowers per square foot. Should it go dry and wilt, it recovers very quickly with new moisture. You may lose some leaves, but it will come back.